The Enfield Shaker Museum and LaSallette Shrine is located on Route 4-A in Enfield, New Hampshire (12 miles southeast of Hanover, N.H.). Take Exit 17 off I-89. At the end of the ramp turn right on to Route 4 east. Travel approximately 1.5 miles on Route 4 east and then turn right on to Route 4-A at the blinking light. It is then 3.5 miles to the Village; follow signs to the Museum. It may come as a surprise to some that Simon Pearce is an actual person and not just a well-known custom trademark for high quality glassware and pottery. Raised in County Cork Ireland, Simon Pearce began his career in glass at the Royal College of Art in London and worked in some of Europe's most renowned glass houses. In 1981, he moved his operations to Quechee, Vermont, where he completed a restoration of an historic woolen mill and harnessed the hydro-power of the Ottauquechee River to fuel his glass furnace. Due to damage sustained from Tropical Storm Irene flooding, our glassblowing and pottery demonstrations will not be available at this location until further notice. 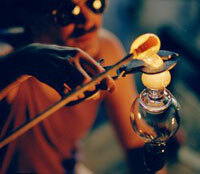 Visit their Windsor, VT location at 109 Park Road for glass blowing and pottery workshops. The Montshire Museum of Science is a hands-on Museum located in Norwich, Vermont, offering dozens of exciting exhibits relating to the natural and physical sciences, ecology, and technology. The building is located on a 110-acre site near the Connecticut River, and the Museums' outdoor environment is a large part of the visitor experience. Science Park is a two-acre exhibit area in a beautiful, park-like setting. Also outside is a network of easy-to-moderate walking trails for visitors of all ages and fitness levels. 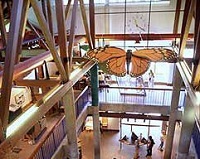 The Montshire Museum is an official visitor center for the Silvio O. Conte National Fish and Wildlife Refuge. Montshire is located off exit 13 off I-91 in Norwich, VT, five miles north of White River Junction, VT. It is directly across the Connecticut River from Hanover, NH, home of Dartmouth College. We have a map for your convenience. The trail is an abandoned railroad bed, wide and smooth, with imperceptible grade changes. It runs parallel to the Mascoma River, crossing it seven times within Lebanon. There is access to the RailTrail at several locations between downtown Lebanon and the eastern border of Lebanon and Enfield: near the eastern end of Bank Street, along Riverside Road, and along Mill Road trail. This trail continues to Grafton, NH. Dartmouth, a member of the Ivy League, is a private, four-year, coeducational undergraduate college with graduate schools of business, engineering and medicine and 18 graduate programs in the arts and sciences. Dartmouth is the nation's ninth-oldest college, founded in 1769 by Rev. Eleazar Wheelock for the education of "youth of the Indian Tribes ... English Youth and others. A unit of the National Park Service, the site features the home, gardens, and studios of Augustus Saint-Gaudens (1848-1907), one of America's greatest sculptors. This web site is sponsored by the Trustees of the Saint-Gaudens Memorial, a non-profit partner of the National Park Service. The exhibit buildings are closed for the winter. The site will reopen on May 28, and then be open daily through October 31, 2005, from 9:00 am to 4:30 pm. Admission is $5 per person for those age 16 and older. The Quechee Gorge, also known as the "Grand Canyon of the East," was formed after the ice age and demonstrates nature's power as the Ottauquechee River carved a swath through the Vermont hillsides. Quechee, Vermont (pronounced kwee-chee), home of the renowned Quechee Gorge, is the quintessential picturesque New England Village. The Ottauquechee River cascades over a spectacular waterfall alongside Main Street, which meanders past beautifully unique storefronts, lodgings, and dining venues to the Festival site on the expansive Village Green. 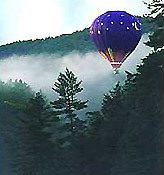 Every Father's Day Weekend, Quechee becomes a Mecca for amateur and professional crafters, musicians, and photographers, as the Annual Quechee Balloon Festival & Craft Fair attracts dozens of balloonists and their brilliantly-colored, hot-air balloons to this quaint Central Vermont Village. The Quechee Chamber of Commerce attributes the success of the Festival to their emphasis on maintaining a family-oriented event with something of interest for all ages. This Annual Father's Day Weekend extravaganza has become a family gathering place for reunions, wedding receptions, birthday parties, and anniversary celebrations. Cardigan Mountain offers some of the most spectacular views of the Central NH area as well as a broad range of hikes to the summit, ranging from hikes for beginning hikers to hikes for only the more hardy types. The Cardigan Mountain area is filled with interesting history ranging from fires that burned over the summits during the 1800's to stories of the hardy families that have inhabited the Firetower over the years. Noted landscape photographer Clyde Smith Jr. spent the summers of his youth atop this mountain while his father kept watch for fires in the region. The West Ridge Trail: Only have a few hours to make a hike? Try the West Ridge trail from Canaan. From the parking lot to the summit is only 1.4 miles. The hike is a rigorous one but goes by very fast and the views are worth the work. The area also offers miniature golf and golf courses, antique and quilt shops, and fine dining opportunities. In addition, some popular attractions are located between 30 minutes to 1 hour away. 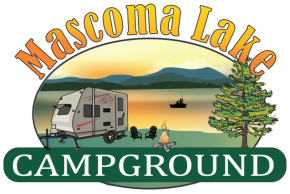 Lake Sunapee offers great boating and fishing and Sunapee State Park has a nice beach area. There's also the New London Playhouse, a popular establishment and one that provides quality entertainment. Mt. Ascutney to the south and Clark's Trading Post and the Polar Caves to the north are well worth visiting.